Building Information Modelling (BIM) involves the generation and management of digital representations of the built environment. Since 2016, all UK government procured projects require Level 2 BIM. The BIM Development Assessment Tool uses established performance measurement practices, BIM literature, and other relevant standards, to build on existing BIM assessment tools (BIM Maturity Measure by Arup and BIM Maturity Assessment Tool by the Cabinet Office) and address shortcomings that include: the nature and grouping of measures; alignment with standards; assignment of responsibility for information delivery; the range of possible responses; the collection of project information; the encouragement of BIM value generation; the ability to customise the assessment; the regular assessment and improvement of BIM development; and the analysis, aggregation and presentation of BIM development performance data. The tool is structured around the framework shown in the figure below and consists of two major parts: Part 1, which measures the BIM development maturity, and Part 2, which measures the supporting processes. 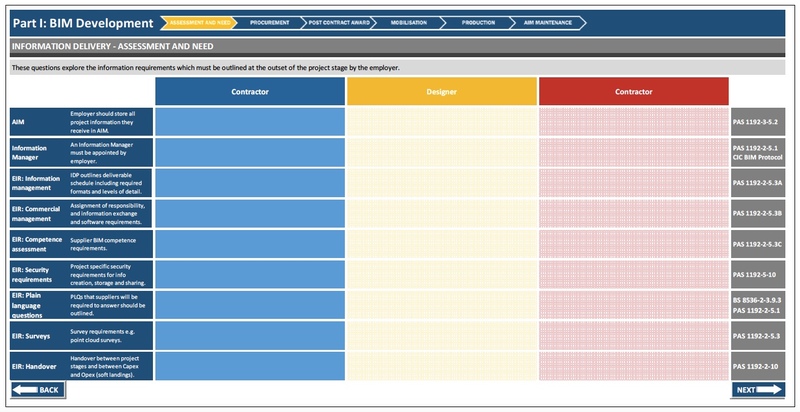 The tool provides separate assessment of the different stakeholders (contractor, designer and employer), and is designed to be used as a continuous performance measurement tool that can be used to track the evolution of BIM maturity throughout the construction phase through to handover. The tool is developed in Excel, which makes it user-friendly and is adaptable to the needs of individual organisations and projects. Furthermore, each time the tool is used, assessment data, linked to the current project information, is outputted to a master spreadsheet. This data can then be used for analysis, aggregation and presentation. The tool has been validated through trials with our industry partners. The current web version of the tool can be found here.